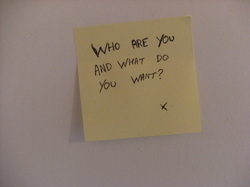 One day, after coming home from work, I found the following post-it note stuck to my fridge. I found this interesting for two reasons: firstly, the fridge was plentiful with milk: there was a four pint plastic bottle of semi-skimmed, a bottle of Guernsey gold-top, a carton of goat's milk and a pot of Alpro soya cream. Secondly, I have no housemate. I live alone and have done ever since I moved out of my parents' house ten years ago. I simply like to be alone: I don't need to explain myself. Who had written this missive? Was it some kind of joke? Had a thief broken in and, finding nothing worth stealing, decided instead to leave me a sarcastic note? Was he (or she) still in the house, hiding somewhere, watching me, ejoying my reaction? I was unnerved and pondered it for the evening. As the night arrived, however, I'd grown less concerned and by next morning I'd forgotten about the whole thing. Just over a week later it happened again. I came downstairs in the morning and opened my fridge. Again, I was baffled. I don't drink Yop. I wouldn't exactly call it a principled stance I choose to take against Yop products; it just never crosses my mind to buy the stuff. 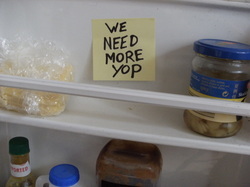 Foremost in my mind was not Yop milkshakes, however, but the note. Who was leaving these things? No noises had woken me during the night and I couldn't see any signs of a break-in. A disquieting thought: whoever or whatever had left these notes was, by process of deduction, not only still in the house but, in all probability, had been since the arrival of the first note. Either that or they had a key. I spent some time investiagating under my bed, behind my sofa, inside my wardrobe. Nothing. Just spiders, lost change and pen-lids. I dressed and left for work. Disturbed, I decided it was probably best if, rather than cooking a meal, I just got a takeaway and avoided the kitchen until the morning. That night I was unable to sleep, hyper-aware of every nocturnal creak and crack, terrified by this presence in my house. Who was it? What did it want? Was it really there? Was a bottle of Yop and some chives genuinely all it would take to exorcise this kitchen guest? In the morning I found no new notes. I left for work. When I returned I again found nothing new. Things settled down over the next few days: I replaced my tin-foil, I cooked, I watched dvds, I started reading the first in a series of lengthy fantasy novels. 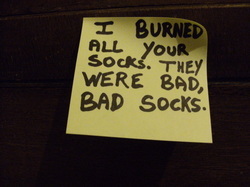 They were just one of those things, the post-it notes, I decided. A weird, kooky story I'd tell people one day. Then, about a month later, whilst I was baking a flan I opened a cupboard to get the flour and instead found this. Again, this alarmed me. Was it a note from a few weeks ago, one I'd simply missed? I couldn't remember having cause to look in the flour-cupboard since then. And there was only one note on its own. Yes, I decided. It had been left with all the other notes last time, from whoever it was who'd been pulling a practical joke on me. 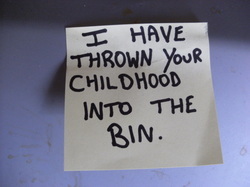 I took the note from the back of the cupboard, screwed it up and went to put it in the bin. However, I was confronted by this. My hands shook as I took the lid from the bin. After standing staring into the bin for a few minutes, I turned all the house-lights on, found a playlist of the more cheery Oprah Winfrey interviews on Youtube, and passed the remainder of my evening huddled alone in my bed, gently sponging clean these artefacts of my youth. I fell asleep hugging Trevor (the gorilla wearing boxing gloves) exhausted and terrified, encircled by whatever malevolent spirit was surrounding me in this house. I thought things might seem more comprehensible in the morning. However, the first thing I saw when I awoke was that my drawer was open. 'Never mind!' I shrieked. Who needs socks, really? What's the point of them? I could just wear my suit without socks. No-one would notice anyway. I seemed to remember the guy in Hawaii 5-0 didn't wear socks. My daily outfit would now be a tribute to him, whoever he was. 'Oh well!' I yelled. I'd just get dressed and leave. I returned to my bedroom and opened my wardrobe. I'm a man of few clothes and the gap where my suit should have been was instantly obvious. I went through the motions of hunting round my bedroom, knowing search to be futile, a dread creeping through me. When I went out to the top of the stairs I found this. As I say, I'm a man of few clothes, and I was forced to go into work that day in only a dressing gown and a pair of diving flippers. Needless to say, I was immediately fired. I returned home, upset and angry. As I slammed the front door closed behind me I heard something - a low hum - coming from the kitchen. 'Hello?' I called out. 'Is there someone there?' No response. Tenatively, I walked through and found myself alone. 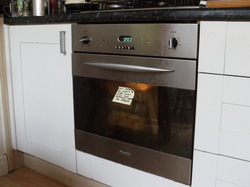 I saw the oven was on, a note stuck to it. Again, my hands shook as I reached out. 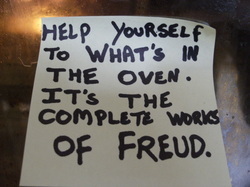 Shocking though this was - I don't own any books by Freud - it actually left me less upset than the previous missives. Of course, I thought. I've lost my mind. And that was fine. I'd already lost my job: a stack of hot psychology books, whilst unanticipated, seemed comparatively manageable. Then I saw the fridge. On and on it went, note after boring note of tedious, mindless, monotonous whingeing: women, racial groups, local families, politicians, stand-up comedians, deceased Carry On cast-members, nearby bollards, teenagers' ringtones - the house had opinions on all of these, each increasingly boring and unoriginal. As I crouched, growing uninterested in a post-it containing a tangent on the numerous failures of the local council to handle the overgrowth of a nearby shrub which, in the house's opinion, was now unacceptably out of control. This, I realised, wasn't a house; it was a taxi driver.